We all have that spot where we drop our stuff the moment we step into our home or office. To help you make that go-to spot less cluttered, we created Charge & Sync Dock, the ultimate home for all your Lightning powered devices. This stand is small, light and portable and it's curves inspired by the newest iPhone design. 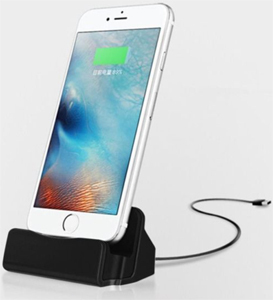 Use this beautiful little stand for hands-free use of your iPhone or iPad mini, while keeping all your Lightning connected devices fully charged. The Charge & Sync Dock includes a Lightning to USB Cable to keep your iPhone charged at all times. Lightning to USB cable connects your iPhone, iPad, or iPod to your computer’s USB port for syncing and charging. Compatible to Apple USB Power Adapter (not included, but available from us) for convenient charging from a wall outlet. Also Compatible with Apple iPad mini (all generations) and iPod nano 7th Generation, iPod touch 5th / 6th Gen.